Green wasn’t my favorite R.E.M. album when it was first released way back in 1988, and to be perfectly honest, it still isn’t. Not by a longshot. But it was definitely a turning point, both in terms of where they were headed creatively, and certainly – pardon the expression, here – a glimpse ahead towards their eventual ascent to the “greener,” and more lucrative commercial pastures still to come. At the time, Green represented an artistic shift for the former Athens, Georgia based darlings of alternative, largely underground college radio. What can be better understood now in retrospect, is that Green was one of those unique portraits of a promising, but still young band, standing perched at the crossroads. Surprisingly, their graduation from the ranks of indie – though, not really – imprint I.R.S., to the big leagues at Warner Brothers, didn’t diminish any of their indie-cred. In that respect, R.E.M. was seemingly bulletproof, even when it came to their core-constituency of music nerds and critics like me (who appreciated their retro-Byrds jangle), and hipsters (who liked them because, well, because they were cool). But the musical changes that came along with R.E.M.’s rise to the majors, though subtle in ways, were still hard to miss. From “Radio Free Europe” to “Fall On Me,” R.E.M.’s songs always carried a great pop sensibility with them, and that aforementioned Roger McGuinn guitar twang Peter Buck had perfected to a science only further reinforced this. But what was different about the songs on Green was that the sound itself was so much bigger than it had ever been before. One listen to the punchier, harder sounding rock of “Stand” and “Orange Crush,” and there was little doubt that R.E.M. had their eyes on the prize of mainstream rock radio airplay, and of making the big leap from 3000 seat theaters to 15000 seat arenas. Interestingly enough, R.E.M.’s biggest commercial success came not as a result of their brief reincarnation as an album-radio worthy hard rock band, but when they actually quieted down a bit on their next few Warner Brothers albums, Out Of Time and Automatic For The People. But if indie-pop was what initially brought R.E.M. to the big dance in the first place, songs like Green’s “Get Up” and “Pop Song 89” proved they still had a few of those steps left in them yet. “Pop Song 89” (a genuine power-pop gem), is perhaps best remembered for the hooky lyric “Hello, I saw you, I knew you, I think I remember your name.” But it may have also been the very first time that Stipe’s lyrics were so easily deciphered, and for some of us this became a real bone of contention. As much as the bigger sounding production on Green brought the brightness out from under the comparative murk of previous R.E.M. recordings, this also meant the certain end of all those endless nights trying to sort out just what Stipe was singing about for music obsessives like myself. In that respect, the thrill was gone. Fortunately, I’m no longer a twenty-something music snob, and I can now appreciate this album for what it truly was, and remains today. Not only do the songs sound great now, Green also represents one of those rare snapshots, of a young band of arty upstarts in transition, shedding their former skins to eventually claim their future place amongst the truly great ones. Green is still not my favorite R.E.M. album. I’ll always have a softer spot for the band’s I.R.S. days, and albums like Fables Of The Reconstruction and Life’s Rich Pageant. Lotta memories there. 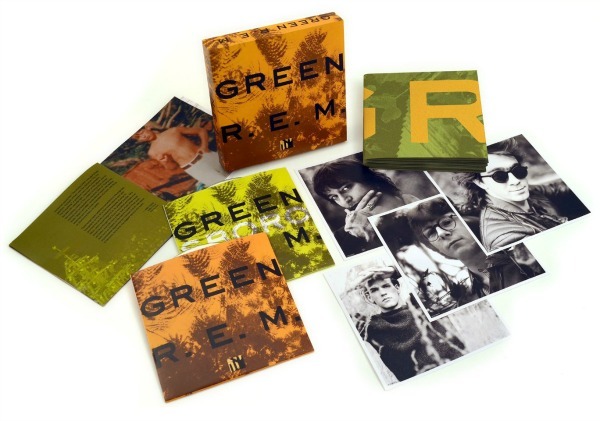 Green: The 25th Anniversary Deluxe Edition comes housed in a hard clamshell box, with four postcards and a foldout poster, plus insightful liner notes by Uncut editor, Allan Jones. It also includes a second disc featuring the complete live show recorded in Greensboro, North Carolina on November 10, 1989, parts of which were previously released as Tourfilm. For R.E.M. fans, this is essential listening. For the rest of us, it’s a worthy start. ‘My Depression Is Always Trying to Kill Me’ is quite a tongue-in-cheek name for an EP inspired by such a dark topic.